Home > News and media > News > BAME into Leadership 2018: What is your story? BAME into Leadership 2018: What is your story? 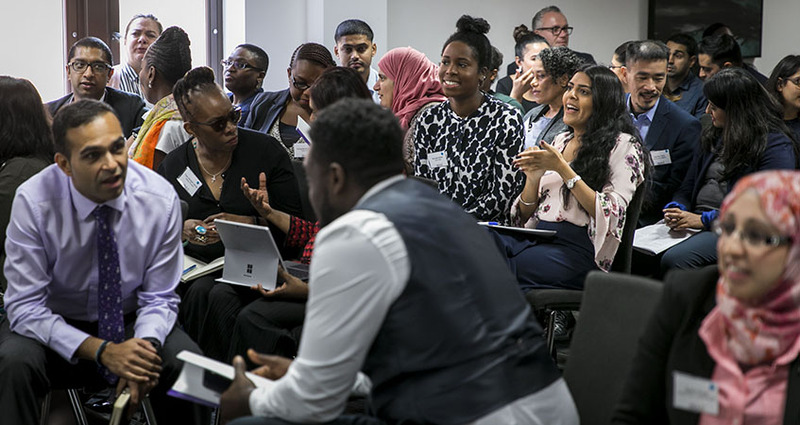 On Wednesday 10 October, Prospero House saw the ninth annual BAME into Leadership London conference: a day designed to help delegates reach their career ambitions, chaired by HMRC Assistant Director Tolu Oyelola. Kelly described her belief that speaking truth unto power is even more important during such times. “Often when things go wrong in Government it’s because someone didn’t feel able to raise a red flag.” Accordingly, she underscored the need to create an environment where people felt able to say challenging things. Fortunately, he realised his own stasis in time, fought against it and proceeded to become an Assistant Director. EY Partner and 5th on EMPower’s Top 100 Ethnic Minority Executive Roles Models List Sanjay Bhandari delivered the closing address on ‘discovering yourself as a leader’. His speech was then followed by networking drinks. During the day, a range of breakout sessions covered a diverse set of topics from finding your purpose, to performance appraisals, to building and maintaining networks, to networking with confidence, to civil service selection and promotion. BAME into Leadership conferences will be taking place across the UK. To find your local event, see the BAME into Leadership website. FDA and Keystone members receive a significant discount when they book their places.